Located in the small resort of Bottières on the town of Sait-Pancrace, in Savoie, Residence Les Terrasses de la Toussuire *** invites you to the heart of the Maurienne, 8km from the Toussuire and its shops and 50m from the lifts which gives access to the ski area of Toussuire, itself linked to the ski area of Les Sybelles, the 4th ski area in France. Its privileged location in the center of the resort and at the foot of the slopes will allow you to fully enjoy your ski holidays with friends or family. Upon your arrival you will be delighted by the elegance and architecture of this residence of 58 spacious and comfortable apartments that can accommodate between 2 and 8 people. On site you can enjoy all the comfort of a 3-star establishment thanks to the heated indoor pool with massage jets & sauna *. The residence also offers individual ski lockers and baby equipment on request at the reception. You will also find many optional services such as cleaning at the end of your stay, television, Wifi access, access to the car park, as well as the rental of bed linen and towels. Nearby you can practice downhill skiing on the 55km of tracks in the area of Toussuire or join the Sybelles and the 310km of tracks that make it up (link by ski lift and red slope only). For cross-country skiers, 25km are set up in La Tossuire and 33km are passable to Sybelles. Thrill-seekers will be able to meet on the 2 snowparks (including 1 accessible from La Toussuire) or the boarder cross while the walkers will enjoy the 50km of pedestrian routes. Also find the traditional activities of winter sports with the walk in sled dogs or snowshoes (5 routes), sledding or climbing on icefall. La Toussuire is 8km from Bottières; it is connected by road only in case of lack of snow and by personal vehicle obligatorily because there is no shuttle service. 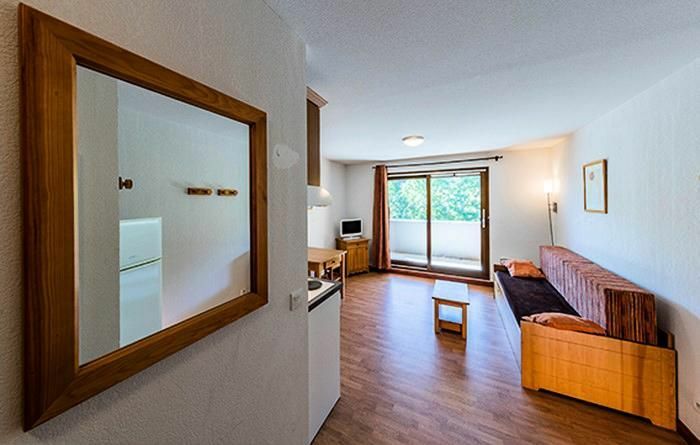 Studio of 25m² for 2 persons, composed of a living room with a pull-out sofa-bed for 2 persons, a fitted kitchen area, a bathroom with shower or bath, separate or separate toilets and a terrace or a balcony. The apartment has a kitchenette equipped with electric hob, fridge, microwave oven, dishwasher, coffee maker and all necessary kitchen utensils and crockery for 2 people. Note: some apartments are accessible to people with reduced mobility. Inquire about availability with our Information / Reservation service. LES BOTTIERES: Motorway A43 to Saint Jean de Maurienne, then follow Vallée de l'Arvan (CD 926) and finally Saint Pancrace - Les Bottières (CD 926). JARRIER: Motorway A43 to Saint Jean de Maurienne, then follow Vallée de l'Arvan (CD 926) and finally Jarrier. By plane: Chambéry airports, Lyon Saint Exupéry, Geneva Cointrin, Grenoble St Geoirs.